Hans Maier, born in 1931 in Freiburg im Breisgau, is Professor Emeritus in Political Science and the Theory of Religion at the University of Munich. He was the Bavarian Minister of Culture and Science from 1970 to 1986 and President of the Central Committee of German Catholics from 1976 to 1986. Major publications include Revolution und Kirche (1959), in English, Revolution and Church: The Early History of Christian Democracy, 1789-1901 (1969). Also Die ältere deutsch Staats- und Verwaltungslehre (1966), Die christliche Zeitrechnung (1991); Politische Religionen (1995); Welt ohne Christentum - was wäre anders? (1999) and Das Doppelgesicht des Religiösen: Religion – Gewalt – Politik (2004). 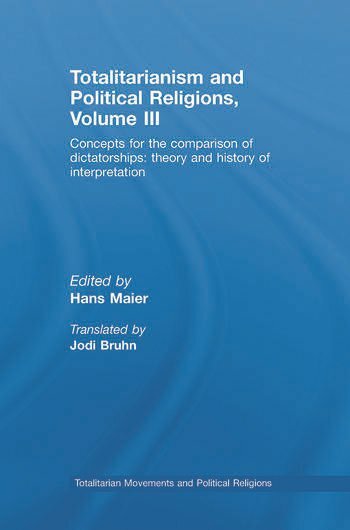 This is the second volume of the three volume set on Totalitarianism and Political Religions.